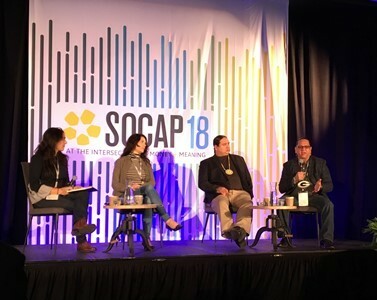 I attended the SoCap (Social Capital) Conference this October in San Francisco. SoCap is the world’s leading conference on impact investing. The goal of this annual conference is to activate the power of capital markets to drive positive social and environmental impact. I attend each year because it provides an opportunity to have face-to-face conversations over lunch, coffee or post-conference gatherings with those in the field with whom I do not normally get to chat, such as Chrystel Cornelius of First Nations Oweesta Development Corporation (active Swift investment) and Nick Tilsen of Thunder Valley Community Development Corporation (active Swift investment) and NDN. Besides the amazing people who attend, there are over 500 panels discussing topics such as: impact investing, gender & markets, racial equity, transformative development, indigenous communities, blended finance, Africa, circular economy, alternative ownership models, refugees, opportunity zones, blockchain for impact, etc. In general, it is a fantastic place to listen, learn, share and get inspired. We Feed the World is coordinated by Swift grantee, The Gaia Foundation, and brings together an international team of farmers, award-winning photographers, NGOs, the food sovereignty movement and ethical businesses in celebration of small-scale farming and agro-ecology. Click here to learn more. Now the project is over but the relationships and new ways of thinking and doing remain – and its lessons have been published in a 216-page book, “El morral de experiencias para la seguridad y soberanía alimentaria.” Click here to download a free copy of the book. Losing the Serengeti: The Maasai Land that was to Run Forever is based on field research, never publicly-seen-before documents, and an in-depth investigation into Tanzania’s land laws. This report is the first to reveal the complicity between Tanzanian government officials and foreign companies as they use conservation laws to dispossess the Maasai, driving them into smaller and smaller areas and creating a stifling map of confinement. Click here to download the report by Swift grantee, Oakland Institute. Indigenous peoples are among those affected most by climate change but at the same time have contributed and can actively contribute positive solutions to mitigation and adaptation. They have done so throughout the centuries, managing and ensuring the integrity of ecosystems on which their survival, physical and spiritual, strongly depends. Click here to download the publication by Swift grantee, Tebtebba. The new AFSA publication ‘Know Agroecology’ is a media guide for African journalists and communicators to better understand and share information about agroecology and food sovereignty. In developing this guide, AFSA recognizes that communication is one of the key ingredients for influencing policy, both by agroecology communicators and journalists. Click here to download your free copy.